Adoration of the Blessed Sacrament after 9.30am Mass every Thursday, ending with Benediction at 6pm. A “Loop System” has now been installed in the Main Church and the Day Church to assist the hard of hearing using hearing aid devices. In the interest of preserving heat in the Church, might people kindly ensure that the outside door is kept closed. A SUM OF MONEY HAS BEEN FOUND IN THE CHURCH. PLEASE CONTACT FR GERARD OR THE PAROCHIAL HOUSE. A meeting will be held with those parents (of First Holy Communion Children) who are taking responsibility for organising the next “Let’s Be Family” Mass on Saturday 5th May at 7.30pm. The meeting will take place in Scoil Mhuire on Tuesday 24th April at 8.15pm. A meeting of the Liturgy Group Re: the “Let’s Be Family” Mass will take place in Scoil Mhuire on Tuesday 24th April at 8.45pm. SCOIL MHUIRE are hosting a Ladies night “Say Yes to the Dress” fundraiser in the Highlands Hotel on Friday 27th April. Doors open at 8pm. Admission €5. Door prize for best dressed. Spot prizes galore. Large selection of dresses and shoes on offer. Debs, Occasion and Day dresses available. Beauty demo on the night. Come along for a fun night. FREE DIGITAL SKILLS FOR CITIZENS TRAINING. 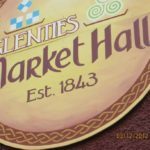 Commencing in the Market Hall, Glenties on Monday 23rd April from 10am to 12 noon. To book contact 087 2679321. MEDJUGORJE IRISH CENTRE PILGRIMAGES 2018: 7 nights B&B and Airport Shuttle service from €279 per person. For further info and book the dates that suit you. Tel. 01 443 4510 or email reservations@med-irishcentre.com. GLENTIES DRAMA GROUP would like to thank all those who supported their recent production of ” The Communication Cord ” by Brian Friel. We were delighted to be able to donate €2000 to The Kevin Bell Repatriation Trust. Also, our local charity shop “Shop and Share” and Glenties Museum each gained just over €400 from their respective raffles. Again, thanks to all who supported us in any way. LOOP SYSTEM: A “Loop System” has now been installed in the Main Church and the Day Church to assist the hard of hearing using hearing aid devices. There will be Adoration of the Blessed Sacrament after 9.30am Mass on Thursday, ending with Benediction at 6pm. Ministers of the Word and Ministers of the Eucharist: An Evening of Prayer, Reflection and Practice will be held in the Church on Thursday 19th April from 7.30pm for all existing and new Ministers of the Eucharist and Ministers of the Word. “Human rights are not a privilege conferred by Government. They are every human being’s entitlement by virtue of our humanity.” Mother Teresa. A Sincere Thank You to all who gave so generously to the Donegal Youth Choir Collection. €310.50 was raised for their Lourdes Trip. PROTECT THE 8TH: Conference at the Mount Errigal Hotel on Tuesday April 17th at 7:30pm. The AGM of The Glenties Development Group will take place on Monday 16th April in the Community Centre at 9pm. Everyone is urged to come along, all committee groups in the area are asked to be represented. Tickets must be booked online for the Festival of Families event on Saturday 24th August and the Closing Mass with Pope Francis on Sunday 25th August. If you wish to attend you must register online at www.worldmeeting2018.ie. These tickets will become available within the next four to six weeks. Volunteers are also required. And whenever we need Him, He’ll always be there! Last week’s OFFERTORY COLLECTION amounted to € 1,717.00. THE COLLECTION FOR THE WORLD MEETING OF FAMILIES AMOUNTED TO €140. There was no winner of this week Gaa Lotto the numbers drawn out were 01-07-26-28 and the 2x€50 went to Terance & Kathleen Gallagher, Buncrubog & Patrick Mc Guigan, Ard Connell. Next week’s Jackpot will be €8,100. Well done to Naomh Conaill Senior and Reserve teams and Management on the victories over Gaoth Dobhair in the Division 1 league at the weekend. Senior 1-9 to 0-10. Reserve 3-12 to 0-11. next league game will be away against Naomh Micheal on Sunday 15th April @1:30 & 3pm. There will be Adoration of the Blessed Sacrament after 9.30am Mass on Thursday ending with Benediction at 6pm. There is an extra envelope in your box for this Sunday, 8th April, for the World Meeting of Families which takes place in Dublin in August 2018. If you wish to attend any of the events you must register as soon as possible. You can also register as a volunteer. To register go the WMOF Website www.worldmeeting2018.ie. ACCORD CATHOLIC MARRIAGE CARE SERVICE: Are you interested in becoming a Facilitator to share your positive married experience with engaged couples? Contact ACCORD Letterkenny Centre 074 9122218 or email accordletterkenny@eircom.net. 50TH REUNION COMPREHENSIVE SCHOOL, GLENTIES: Were you in the Classes of 1968? If so you are invited to join us on the weekend of the 4th and 5th August 2018 in the Highlands Hotel, Glenties. For information please contact 083 0476277 or 087 3276071. Tuesday 10th Main Street, Tullyard Road, Dr. Mc Closkey Crescent, Stranaglough, Meenalargan, Ard Patrick and Ard McGill. Wednesday 11th Stonepark, Derries, Kilraine, Drimnacrosh, Mullantyboyle, Narin Road, Loughcrillan Road, Letterilly, Maas, Ard Connell, Glen Road. Bingo in GLENTIES COMMUNITY CENTRE every Tuesday night at 9pm. Jackpot €10,900 on 45 numbers or less if not win €300 will be paid out, €100 a house, €50 a line. Snooker Room is opened from 4.00 pm to 09.00 pm. Anybody wanting to book the Community Centre please contact 087 2679321 or call to the Community Centre Office between 10am – 2 pm Monday – Friday. Emily Bonner Irish Dance Classes Wednesday @ 3.30pm – 7.15pm. Tai Chi Wednesdays from 8.00pm – 9.30pm. Glenties Community Centre Amalgamated Ltd CE scheme have a vacancy for Horticultural workers, Maintenance workers, Caretaker. C.E criteria applies. C.E workers can avail of training to up skill while on CE scheme. To apply for the above please e-mail glentiescommunitycentre@yahoo.ie or ring 0879695053 for more information. Margaret Connell, THE FOOT CARE PRACTITIONER, will be in the Day Centre on Monday 9th April. To book an appointment call 087 1417180. Service of Remembrance (Interdenominational) is being held for those who have suffered the loss of a baby through Miscarriage, Stillbirth or Neo-Natal death at Letterkenny University Hospital. The service will take place in Conwal Parish Church (Church of Ireland, beside St. Eunan’s Cathedral) Letterkenny on Sunday 8th April @ 4pm. ANAM CARA DONEGAL, the organisation that supports bereaved parents, is holding a Parent Evening on Thursday 12th of April from 19:30 to 21:00 in the Radisson Blu Hotel, Letterkenny, Co. Donegal. This event is free and open to all bereaved parents regardless of the age your child died, the circumstances of their death, or whether their death was recent or not. CEILI NIGHT in Rosses CDP building, Dungloe on 15th April from 8 – 11pm. Music by Michael Coyle. Admission €8. PROTECT THE 8TH Conference at the Mount Errigal Hotel on Tuesday April 17th at 7:30pm. Last week’s OFFERTORY COLLECTION amounted to € 2,550.00. The Good Friday Collection for HOLY PLACES amounted to € 1,060.00. Thank you for your very generous contributions to these collections. The recent collection for Mary’s Meals amounted to € 55.05. Thank you . Last week’s OFFERTORY COLLECTION amounted to € 660.00. There was no winner of this week Gaa Lotto; the numbers drawn out were 7-15-18-30 and the 2x€50 went Gerry Doherty, Tullyard Rd and Crona Regan, Stone Park. Next week’s Jackpot will be €10,000. Club 200+ draw number 9 took place on Tuesday 4/4/17 and the winners €300 Michael Gallagher, Derries 7x€100 Michael Regan, Mill Rd Claire Kenney, Narin rd Nora Gallagher (phildy), Glen Rd Anthony Thompson(snr), Ard Mc Gill John Bonner, Glen Rd Eimer O Donnell, Mill Rd Sinead Brannigan, Highlands Hotel. Congratulations to all the winners and the next draw will take place on Tuesday 2/5/17. Over the Easter weekend Naomh Conaill present the eagerly awaited “League of Extraordinary Glenties Men”. A must see show featuring a variety of characters from around the town as you have never seen them before. You have seen one trailer, now keep an eye out for the sequel. Shows are taking place in the community centre on Good Friday 14th & Easter Sunday 16th April at 8pm. Tickets are priced at €10 and go on sale in the Cope Shop and from Vincent Cranley (087) 1770243 or Seamus O’Malley (087) 410 6737. Get your tickets early so you don’t miss out as these will go fast. Fri has sold out only tickets left for Sunday. Fixtures: Wed 12th April Minor League Naomh Conaill v An Clochan Liath, Fri 14th April U16 League Naomh Conaill v Four Masters, Sat 15th Division 5 league Pettigo v Naomh Conaill @6pm, Sun 16th Senior and Reserve league Glenswilly v Naomh Conaill @1:30 – 3pm. Congratulations to Ethan, The Donegal team and Management on winning the Ulster U21 Competition with a great win over Derry. There was no winner of this week Gaa Lotto; the numbers drawn out were 1-15-23-25 and the 2x€50 went Margaret Boyce, c/o Martin Doc and Frank Mc Swiggan, Gortnasillagh. Next week’s Jackpot will be €10,000. A big thank you to all who supported our ‘Come Dine with me’ fundraiser. Most of our hosts held their dinner parties on St Patrick’s evening and then finished the night in Kennedys where a great night was had by all. We held a very successful raffle for Paul Dawson’s MS Fundraising. Paul himself was on hand to pull out the winning tickets. Many thanks to all who sponsored prizes on the night namely, Terence in the Blue Haven, Rosaleen and Conal in Lisdanar B&B, Sean and Geraldine in Donegal Waste, Glenties Furnishings and of course Paul Dawson himself who kindly donated a gallon of grouse. Kieran Kennedy also sponsored a super prize of an overnight hotel break for two which was specifically set aside for one of the hosts. Bernie O’Malley and Pauline Gallagher were the lucky winners. Sean McLoone, your local coal-man, kindly sponsored wine for each of the hosts to which we are very grateful. Last but not least a huge thank you goes out all of our hosts. All of our hosts admitted it was hard work but totally enjoyed the evening so well done to you all. We still have some dinner parties organised in the coming weeks as this weekend didn’t suit everyone so hopefully all goes well for them and don’t forget to forward your pictures to the Club Facebook page. Over the Easter weekend Naomh Conaill present the eagerly awaited “League of Extraordinary Glenties Men”. A must see show featuring a variety of characters from around the town as you have never seen them before. You have seen one trailer, now keep an eye out for the sequel. Shows are taking place in the community centre on Good Friday 14th & Easter Sunday 16th April at 8pm. Tickets are priced at €10 and go on sale Monday 3rd of April in the Cope Shop and from Vincent Cranley (087) 1770243 or Seamus O’Malley (087) 410 6737. Get your tickets early so you don’t miss out as these will go fast. Naomh Conaill is holding a club meeting on Monday 10th April at 8:15pm in the clubhouse. Please attend and have your say. The death took place in Sligo Hospital on Monday 13th April 2015 of Finola McMahon, Old Golf Course Road, Donegal Town. Burial took place on Thursday. She is survived by one daughter, Helen, four sisters, Mary, Anne, Pauline McGill, Glenties, and Regina and one brother, Kieran, aunt, Nuala, uncle, Seamus, nieces, nephews, in-laws, other relatives and friends to whom sincere sympathy is extended. Her husband, Maurice, died in 2009 and her brother, Aidan died in 2013. The death took place in Letterkenny Hospital, on Friday 17th April 2015, of Danny Mc Gill, Glen Road, Glenties, (native of Ardara). His Remains were taken home later that day and to St. Connell’s Church, Glenties on Sunday. Burial took place in New Graveyard, Glenties, after Requiem Mass at 3 p.m. Danny is survived by his wife, Rose, daughters, Mary, Breid, Anne-Edel and Carmel, sons, Dinny and Kevin, grandchildren, nieces, nephews, in-laws and other relatives and friends to whom sincere sympathy is extended. Sincere sympathy is extended to Brendan and Brenda Mc Geehan, Fintown, on the death of their baby daughter, Leah, which took place on Thursday 16th April 2015, just two years old; also to Leah’s grandparents, uncles, aunts and all other relatives and friends. Scoil Mhuire is having another ‘Cash 4 Clobber Collection’ on Friday 1st May. We accept bags of men’s, women’s, & children’s clothing, paired shoes, handbags, belts, bed linen, (no duvets or pillows) curtains etc. We would like to take this opportunity to thank you for your support with our collections in the past and we look forward to another successful collection on the 1st May. Feel free to drop your bag(s) into the school anytime prior to the collection. First Holy for the children of St. Riaghan’s Drimnacrosh KilkennyN.S., and Scoil Mhuire, will take place in St. Connell’s Church, Glenties, at 11.00 a.m. this Saturday 25th April. The Annual Party for The First Holy Communion Children, their families and guests, will be held in the Community Centre after the Mass. Refreshments will be served, for everyone attending. All Donations would be gratefully appreciated to help cover costs. Bingo held in Glenties Community Centre every Tuesday Night at 9 p.m. Jackpot €4900 on 45 numbers or less if not won €300 will be paid out, €100 a house, € 50 a line. New CE Scheme: New CE scheme started on 22nd September 2014, Any one willing to start contact 087 9695053 for more details. FAS criteria apply. Bowls: Bowls on Monday nights. The winners at the Bingo on Tuesday 14th April in the Community Centre, Glenties were – €15 Winners – Micheal Langan, Jamsie Melly, Georgina Mc Hugh and Marie Boyle; €25 Winners – Patsy Mc Dyre and Patricia Molloy, € 50 Winners – Reene Mulhern, Breege Roarty, Maureen Gildea, Caroline Kee, Emer O’ Donnell, Cathy Anon, Sally Mc Guigan, Peter Duffy, Cathy Anon, Pauline Mc Geehan and Adam Mc Dermott; €100 Winners – Ann Quinn, Angela Lowther, Shane Whyte, Bernie Martin, Adele Dooley, Patsy Mc Dyre, Nancy Gill and Mary Mc Gill – €300 Winner – Breid Gallagher.